Narrative Whispers is an insight into the role of the artist and the multiple stages involved in producing art. It pinpoints different aspects of this operation, including the location of making, the collecting of materials, the learning of processes, and the eventual interaction with an audience. Through this Narrative Whispers brings forth an awareness of creative thinking as a tool for communication and the artist’s role in connecting the acts of seeing and telling. David Foggo’s ‘The Exhibition...(Wipeable version)’ and Louise Webb’s ‘A conversation between Kearsney and Spencer’ explore location and the influence that the studio has on the direction and narrative of an artist’s practice. Building on this, Desmond Brett’s durational residency, entitled ‘new limbs/unconformities/autosuggestions’ allows the audience to witness his evolving ideas as he makes new work live in the gallery throughout the exhibition. In Ben Beauchamp’s live poetry performance ‘Unsound body and mind’, he explores creative thinking as communication by projecting a stream of nonsense in which trial and error occurs. Naomi Harwin, Michael James Lewis and Mark Houghton all demonstrate the repetition that can be involved in the process of making art, forming multiples in order to develop new stages of making. Exploring interactions, Ranieri Spina and Oliver Payne recognise the audience as a part of each artwork and actively engage with them on this level. Benjamin S. Beauchamp, being of unsound body and mind declares that in his performance he shall spout nonsense before an audience, if only he had something to say. This is not his will, nor should any of his testimony be considered binding. Beauchamp will place words in an order un- befitting of decent and recognisable language. Beauchamp will invoke meaning to be lost in the failing translation of thought into a form that can be communicated, and in this miscommunica- tion, new meaning may be found, whereupon his intent shall become irrelevant. David Foggo is currently a studio holder at NewBridge, Newcastle upon Tyne. Language is a key element in Foggo’s practice and his text work ‘The Exhibition...’ existing in two formats: firstly, as an acrylic on canvas panel installation and secondly as shown in Narrative Whispers. This sec- ond version, (wipeable), is marker pen on whiteboard, further emphasising the ephemeral nature of the piece. Foggo regards the work as a statement on the fleeting moment and imperma- nence in the widest possible sense. Desmond Brett presents working and thinking in progress. 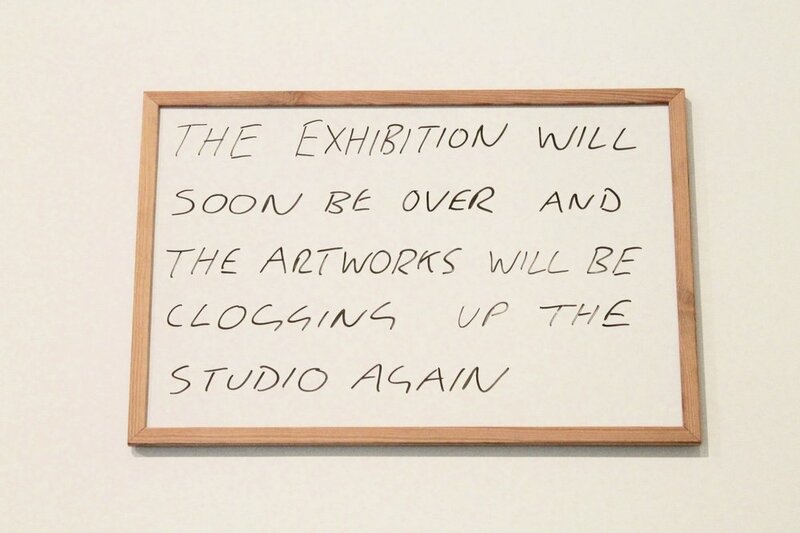 A collection of objects and visual material neither started or finished but existing somewhere in between, that, over the duration of the exhibition will be altered by further additions. These are accumulated scraps, sculptural prompts and collected matter of unrealised projects and half formed ideas. Drawing is under- taken as a speculative methodology that calls upon encounters, memories and improvisation to generate propositions for sculptures that have yet to be made. The studio is a place of struggle. Louise Webb’s installation piece ‘A conversation between Kearsney and Spencer’ centres on the contrasting elements of two locations. Interested in objects that do not belong, Webb has created a series of visuals using found items, digital devices, the process of painting and use of fictional narrative. Within her practice Webb investigates the use of language and its use by both artist and viewer in the interpretive process. Semiotics of theatrical set design strongly influence the visual structure of the installation, continuing to respond to the idea of the suspension of disbelief. Although Mark Houghton’s works deal primarily with the linguistics of painting, they are intended as objects, not images, combining both pictorial and physical space within the same context. Houghton’s paintings/objects incorporate diverse materials such as concrete, steel and wood to suggesting an infusion of hope and optimism. The surfaces embody time and a physical relationship with a two dimensional surface that is drawn into a three dimensional space. Houghton’s The works reveal the material and process of their own construction, and deliberately instigating a dialogue with architecture. Despite repetitious manipulation, the evidence of human endeav- our is knowingly seductive, contemplative and contains a vitality that seems pertinent for a screen based, technological age. Michael James Lewis’s practice is focused on the relationship between the language of architecture and the physical experience of space. Frequently relying on the most basic symbol of drawing convention, the line, he creates structural and graphic diagrams that reduce physical, geographic phenomena into abstracted, clarified prompts. These prompts invite questions about inhabitation, materiality, structure, and order. Lewis’s ‘Drawing Stones’ are a series of prototypes for drawing tools. These hand carved wooden pieces will be cast in graphite and used for drawings and are part of a larger series of work exploring craftsmanship and material processes. This extension of the act of generation is a way to reflect on the process of making. Naomi Harwin is a visual artist based at Wysing Arts Centre in Cambridge. Her work ‘Parts & Wholes (The Studio)’ offers a glimpse into her multidisciplinary practice, which at its core has a strong grounding in process and continually shifts between states of making and unmaking. Harwin seeks to observe the transference of information and understanding from ‘object’ to viewer in a brief visual encounter. 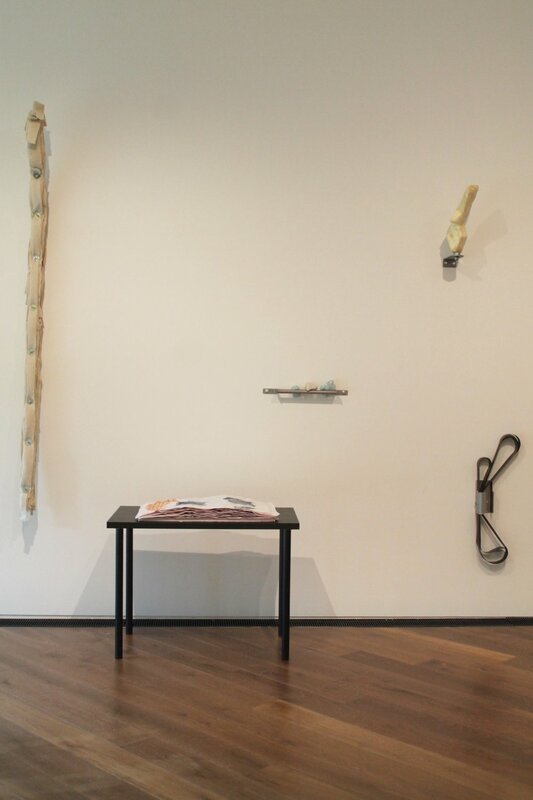 She considers the role of the representation and its relationship to the ‘object’ (in this case Harwin’s sculpted forms). While each shape, line and colour playfully sit between coming from something and going somewhere new. As a musician specialising in improvised music and sound design, Ranieri Spina investigates im- provisation in everyday life, showing how sonic arts is more than a niche for experts. In his work the audience, of all ages, has an active role, interacting with the musician and engaging with a playful medium. Inspired by the idea of the ‘inner child’, Spina sees everyday objects as musical instruments that allow anyone to become a musical improviser. The installation in Narrative Whispers, made of a collection of toys, is an invitation to explore sound. Oliver Payne is a musician and sound artist from Norwich. Payne is interested in the complexities and interest hidden within the banal. He often uses specialist recording techniques or recontex- tualises familiar objects to give voice to the ordinary and the ignored. Alongside many years’ experience within the unpredictable field of Disability Arts, this practice informs OliverPayne’s live performances, often incorporating ephemera and crude electronics to accompany free im- provisational guitar playing.